The charming and attractive look and the fine detailing that our fashion jewelry has is nowhere to be found. The unique combination of Indian and Western looks . Used in big beaded for turquoise color and base is navy blue Our jewelry has gained popularity among younger women. The younger age group is quite experimental with the clothes. Kanchana offers crochet jewelry patterns of all kinds. We use cotton yarn, acrylic yarn and superior quality wires embellished with beads to make attractive jewelry range. Be it fashion jewelry for women or colorful jewelry for kids, we have a wide variety of feather light and funky crochet earrings, bracelets and neckpieces to choose from. Golden imitation chain with crochet handmade butterfly and glass beads-very unique design and combination of beads and fur with matching ear rings. 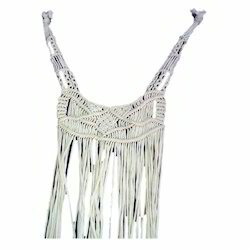 With enriched industrial experience and knowledge, we are providing a wide range of Crochet Necklaces. This necklace is highly appreciated by our customers for its stylish design and fashionable look. Clients can avail from as an innovative range of Crochet Necklaces. This necklaces are crafted from optimum quality material under the guidance of experienced artisan keeping in mind the latest fashion trend of the market. Beautiful Hand Crochet Necklace in Orange color with gold antique metal ball. We offer to our clients superior quality of Crochet Necklace. Our range is specially designed by our experienced and creative designers from pure and genuine raw materials. Our range has fine finishing, attractive designs and patterns and superior polish. Our range is highly demanded by the clients.